Did you know us humans have a background army of microbes that work to keep us healthy, turns out these microbial cells outnumber human cells 10 to 1 in a healthy human body! The human microbiome is beginning to be elucidated that shows most of these microbes have a mutualist relationship such as helping us to digest food or producing anti-inflammatories that our human genome can’t produce. Similar to humans, other mammals are expected to have a similar microbiomes that can contribute to a healthy species. However this area of research is in it’s infancy, our guest is spearheading this effort and pushing the boundaries of avian-microbe interactions in tropical environments that can help us understand what contributes to a healthy bird population. 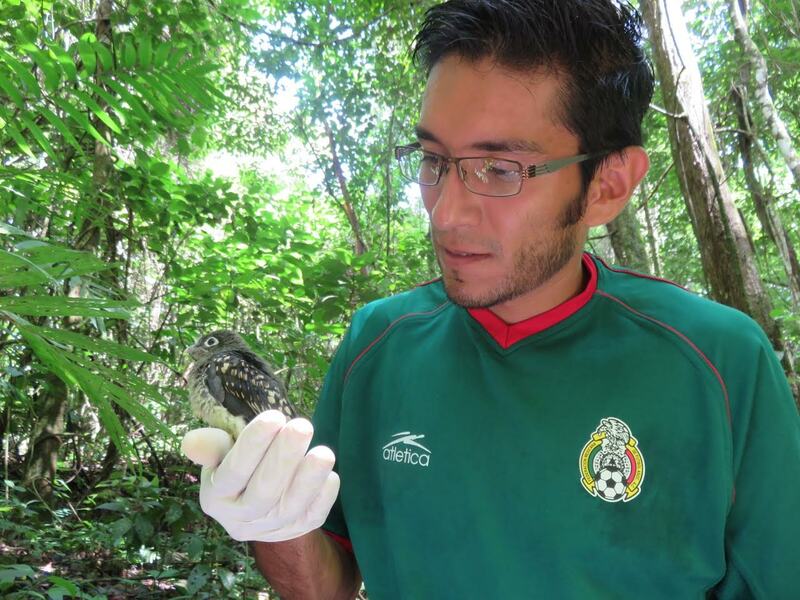 Felipe after sampling a baby trogon (Trogon melanocephalus). This species only nest inside termite nests. Felipe found his way to these avian-microbe questions while pursing a masters degree at a Chamela biological field station in Mexico. He noticed that some young birds he found in termite-associated nests were dirty and grimy, but they were very healthy! How could this be? His curiosity continued to drive his motivation to pursue a PhD in the Biology Department at the University of Oregon. Yes that’s right he’s a duck, but science holds no grudges because all that really matters is what kind of knowledge this research can produce. His passion for the outdoors started young while growing up visiting small towns in the seasonal dry jungles of Mexico. He recalls playing with his siblings but would always stop and look at cool rocks, or to show his friends all the creepy crawly insects he found! Only recently did he discover his siblings thought this was annoying because he was more focused on observing his surroundings than playing games with them; sound like a scientist in the making! 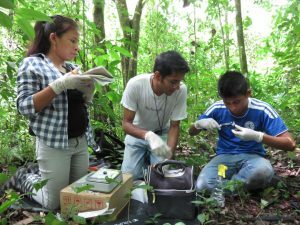 Felipe is teaching two field assistants (Rosi and Jesus) how to take body measurements of chicks. He is now in his 5th year of his project but has run into a sort of barrier; his research interests are the boundaries of where other researchers have ventured. If he is successful he will be one of few who will assess how nesting behavior influence bird-biomes in a tropical setting. Pushing boundaries may sound glamours but it comes at a cost, literally, because few agencies are willing to fund such a new exploration he’s chosen to pursue other means of obtaining funding. Experiment.com is a way of combining a grant submission easily understandable to the public, and they can fund your work similar to a kickstarter. 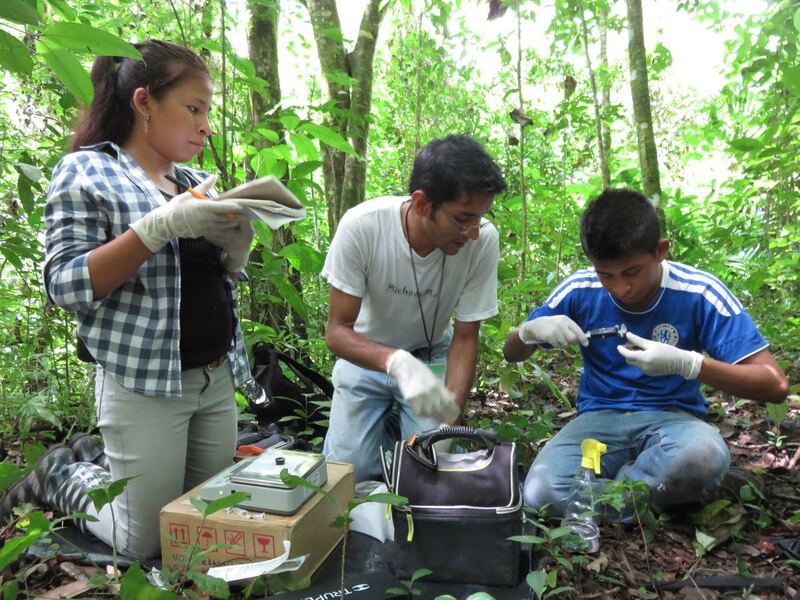 As Bill Gates said, “This solution helps close the gap for potential and promising, but unfunded projects.” Felipe’s campaign to raise enough money to help process 500 samples collected from the Mexican jungles has just started and will continue until the end of November. You can learn more about his project on his Facebook page. If you’re interested in this ‘crowd-sourced’ version of research funding you can read about how the process works. 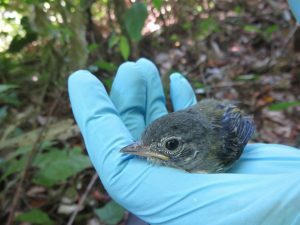 Flycatcher chick after being sampled and measured. You’ll have to tune in to hear the current state of his research as well as how this new funding venture could provide him the avenue to finish his PhD! You can listen October 30th 2016 at 7PM on the radio at 88.7FM KBVR Corvallis, or stream live. This entry was posted in Ecology and tagged University of Oregon on 2016-10-30 by Adrian Gallo.